Despite differences on some other important issues, Verizon CEO Ivan Seidenberg and Eric Schmidt, Google CEO, agree on some matters related to the Federal Communications Commission's "National Broadband Plan." In an opinion piece authored for the Wall Street Journal, the two executives say three plan elements are praiseworthy. Not surprisingly, both agree on the plan's nod to health-care information technology, education and job training, and a smart electricity grid. All of those initiatives will tend to create opportunities for both companies. Both agree on spurring the highest-quality broadband possible, dependent on private investment. Both say they agree on the importance of making high-speed Internet connections available to all Americans. The Internet has thrived in an environment of minimal regulation, they say. "While our two companies don't agree on every issue, we do agree generally as a matter of policy that the framework of minimal government involvement should continue," Schmidt and Seidenberg say. The FCC underscores the importance of creating the right climate for private investment and market-driven innovation to advance broadband. That's the right approach and why we are encouraged to see the FCC's plan, they say. You might argue all of these are "motherhood and apple pie" sorts of issues, which is true. But it might be significant that both can agree to support, in principle, "minimal government involvement." That doesn't mean the two firms agree on key network neutrality principles or rules. But it does seem to signal a willingness to consider approaches which allow markets to sort out issues. As typically is the case in communications regulation, regulators will weigh what is possible and prudent, given the different interests, and take those interests into account, crafting solutions that balance the various interests, giving each side something important, while neither side gets all its wants. That is likely to be case for network neutrality as well. Is FiOS Slowdown Related to Possible Verizon Restructuring? Verizon's apparent slowdown of further FiOS construction could be driven by any number of good reasons, including new skepticism about the financial return, alternate approaches to achieving the same goal, or perhaps other required uses for cash flow. The need to start shifting free cash flow to dividend payments to minority partner Vodafone, or even a more-drastic reshuffling, such as a merger between Verizon and Vodafone, are possible drivers as well. Vodafone is a significant 45-percent minority investor in Verizon, and just about everyone has been expecting some adjustment of the relationship at some point, with the options including each company buying out the other, although a change in the majority ownership status is not inconceivable. But a full-fledged merger also might be on the table. "People familiar with the matter say there are three options being considered by the two sides," the Telegraph reports. The first is a full merger of Vodafone with Verizon Communications; the second would be for Verizon Communications to begin paying a dividend to Vodafone; and the third would be for both companies to sell their respective stakes in Verizon Wireless either to each other or to a third party. It is that second possible outcome that suggests Verizon might have other needs for its free cash. In fact, some observers have suggested Verizon Communications would prefer to buy out Vodafone's stake in Verizon Wireless. But analysts say selling the Verizon Wireless stake is not an option for Vodafone because it would result in a giant tax charge as well as deprive Vodafone of about 30 percent of its total annual revenue. While they are “not aware of any increases in market concentration from such a merger that would raise serious antitrust issues at the U.S. Department of Justice,” a deal that is structured to give Vodafone control over all of Verizon's assets, including landline, would raise national-security questions, though. Online retailer eBay is launching two iPhone apps, one for the eBay.com global marketplace and one for eBay’s new classifieds site, eBayClassifieds.com, part of its plan to sell $1.5 billion worth of merchandise directly from mobile sites. With the new eBay Selling and eBay Classifieds mobile apps, consumers can easily photograph and list an item in 60 seconds or less, eBay says. Consumers can now list for free in eBay’s auction format, reaching 90 million active eBay users around the world, or in eBay Classifieds, to reach buyers in their local communities. Plus, in addition to selling, buying has never been easier with eBay’s leading mobile shopping app and mobile platform and the new eBay Classifieds mobile app. On April 3, eBay will take mobile commerce a step further, with a new version of the eBay app for iPad. The company earlier had released a mobile app for Android devices as well. Suddenlink, an operator of rural and suburban cable TV systems, says it has started offering residential customers in several, suburban-Austin communities (Georgetown, Pflugerville, and Leander) its new “High Speed Internet MAX 107.0” service, featuring a download speed up to 107 megabits per second (Mbps) and an upload speed up to 5 Mbps. The MAX 107.0 service is the result of “Project Imagine,” a new Suddenlink program that calls for approximately $350 million of capital investments nationwide through 2012, above and beyond the company’s traditional capital spending levels. Through “Project Imagine,” the company aims to expand to substantially all Suddenlink communities: video-on-demand service; the capability for up to 200 high-definition (HD) TV channels; and industry-leading DOCSIS 3.0 technology, which enables Internet download speeds of 20, 50, and more than 100 Mbps. Suddenlink is preparing to launch either MAX 107.0 or MAX 50.0 Internet service in a number of other communities this year, with details to be announced later. MAX 50.0 service will feature a download speed of up to 50 Mbps. That will give Suddenlink bragging rights in the speed wars. What remains unclear, as has been the case for other providers offering 50 Mbps service, is how many customers actually will buy the fastest speeds, rather than lower-speed and medium-speed services. So far, no U.S. provider of access at speeds ranging from 50 Mbps to 100 Mbps has been willing to say, in public, what percentage of customers buy such plans, or even the actual number of customers who buy. One suspects that is because relatively few consumers actually think they need such speeds, or that the value-price relationship is better than that of the medium-speed services. Tiered Mobile Broadband Pricing "Inevitable"
Tiered pricing--where higher amounts of use will result in higher prices--is inevitable, say analysts at Coda Research Consultancy, driven by U.S. mobile data consumption toward 327TB per month in 2015. 138 percent CAGR to reach 224TB per month in 2015. At that point, mobile video will represent two thirds of mobile handset data traffic. The key problem, though, is peak demand, at only some cell sites, as already is the case. “As carrier networks now stand, network utilization will reach 100 percent in 2012 during peak times," says Steve Smith, Coda Research Consultancy co-founder. That is going to mean actual blocking of access during peak hours, much as users on older fixed networks once experienced occasional "fast busy" signals that indicated no circuits were available for use. Use of pricing mechanisms will help, as it always does, by allowing consumers to make choices about their consumption. Many object that tiered pricing will face huge opposition from consumers conditioned to "unlimited" usage. I suspect that will prove wrong. Buckets of usage already have been accepted by consumers who understand they can pay less for lower buckets of use, or more money for higher or unlimited use. What users manifestly do not like is unpredictability; uncertainty about how high their bills will be at the end of the month. So long as consumers have accurate ways to measure their own usage, and an ability to adjust their plans as needed, without penalty, users will adapt easily to buckets of broadband usage. In fact, consumers may well appreciate being able to decide for themselves whether they want to pay more to get more, or can simply adjust their usage at certain times of day, or at some places, or delay using some applications, in exchange for lower prices. Mobile video users will grow at about a 34 percent CAGR, to reach 95 million users in the U.S. market in 2015. Use of mobile social networking will grow at a 21 percent CAGR to 2015. Non-text-messaging-derived data revenues will climb at a 17 percent CAGR, and will comprise 87 percent of all data revenues in 2015, says Coda. Why IBM, among others, is bullish on the potential for using mobile broadband networks for all sorts of useful things other than Web surfing or voice calls from mobile phones. 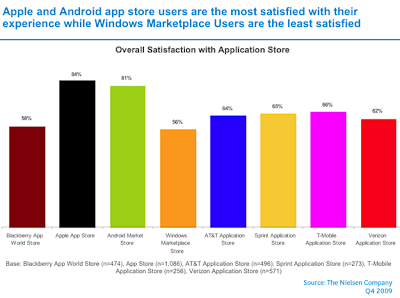 Though many observers, including many service provider executives, might be skeptical about the long-term viability of operator-sponsored mobile application stores, a new study by Nielsen suggests consumers are favorably impressed with operator app stores, as compared to handset stores such as the Apple App Store. Many observers believe device app stores will ultimately gain favor, but a new Nielsen survey finds ongoing loyalty to carrier stores. As of the end of 2009, half of all applications users were accessing carrier app stores according to Nielsen’s new App Playbook service. That is not to say the Apple App Store has lost any luster in the United States. The relatively new BlackBerry App World Store also was the second most popular app store, in part because of BlackBerry’s industry-leading installed base. But carrier application stores were not as far behind as some might think. About 84 percent of respondents said they were satisfied with the Apple App Store, while 81 percent said they were happy with the Android Market. Some 59 percent of respondents said they were satisfied with the BlackBerry App World. About 56 percent reported satisfaction with the Windows Marketplace. Most mobile carrier stores compare favorably with BlackBerry. About 64 percent of respondents were satisified witht he AT&T Application Store, while 65 percent said they were satisfied with the Sprint Application Store. Some 66 percent said they were happy with the T-Mobile Application Store and 62 percent reported they were satisfied with the Verizon Application Store. Nielsen’s App Playbook surveys more than 4,000 application downloaders in the United States every six months about their mobile application usage. Ofcom, the U.K. communications regulator, is not happy with the accuracy of information provided consumers about their real-world broadband access services, and wants to revise the reporting process so better information is provided. Mystery shoppers commissioned by Ofcom have found that 15 percent of the time, "potential customers" were not given an estimate of their access line speed, and 42 percent were only given one after prompting the sales agent near the end of the sales process. The accuracy of the information proved to vary. In some cases, users were given double the line speed of another provider for the same line and technology, and sometimes received different answers over the phone when compared with the website of the same service provider. The majority of line speeds also did not match (within 1Mbps) the speeds given by the BT Wholesale line checker. There is no question but that "best effort" broadband services are difficult to accurately predict or describe. It is true that users will sometimes experience bursts that correspond with the advertised "up to" speed. Most of the time, actual experienced sustained rates are lower, because of contention ratios and actual end user volume. So Ofcom proposes that ISP's provide speed estimates based on line length, line capacitance and line attenuation, all measures that will provide a better approximation of typical download speeds. Ofcom also wants to ensure that shoppers are given this information early in the sale process, particularly before payment information or a request for service is made. Ofcom also seek to ensure that factors that affect broadband speed are explained. Specifically, Ofcom wants to ensure that shoppers are told how network capacity, congestion on the Internet and traffic management policies could affect performance. Consumers also should be told that actual throughput speeds will be lower than advertised or theoretical line speeds. U.K. consumers already have the right to be moved to a cheaper, lower speed option when the plan they bought does not measure up. In cases where their is but one tier of service, Ofcom wants to allow consumers to leave their contracts without penalty. Ofcom apparently will try to get such changes made voluntary. If changes aren't agreed to, or implemented, a regulatory review may occur, which could lead to formal regulation. Such policies are not unreasonable consumer protection efforts. The problem is that formal guarantees are next to impossible so long as connections operate on a "best effort" basis. Even on a quality-assured connection, which would have to be based on packet prioritization policies, throughput will vary throughout the day, based on overall contention for network resources, though far less than is the case on a "best effort" connection. To closely match expected routine performance with an advertised top speed will require packet prioritization. The value of presence-based mobile services will increase to more than $6 billion by 2012, according to Juniper Research. Increasing smartphone penetration in developed markets, coupled with rising global usage of mobile instant messaging will help to drive the trend, says John Levett, Juniper Research analyst. Juniper thinks the key drivers will include presence-based text message alerts and services, geolocation applications that allow people to collaorate, share location details and take advantage of local knowledge, as well as social Web applications including social networking, user-generated content, blogs and dating apps. Up to this point, revenues from presence-based services are almost exclusively derived from operator-billed mobile IM accounts. The amount of that activity faces two contradictory trends, one might argue. 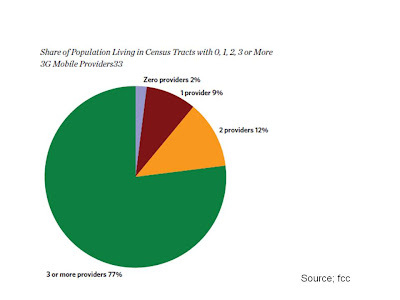 On one hand, mobile IM will tend to fare better as end user adoption of 3G or 4G services increases. Broader adoption of 3G and 4G should therefore lead to heavier use of mobile IM, which should drive higher revenues. Mobile Web applications such as IM work best, and therefore encourage use, on faster data networks. On the other hand, operator-billed IM revenues often are based on user inability to easily use over-the-top VoIP and IM applications that do not drive operator revenues. Over time, access to such open applications will deprive operators of the ability to profit from captive IM application access. Juniper believes there is a way to thread the needle, as mobile broadband becomes a standard service for most developed-market customers and as operators move to embrace mobile VoIP in ways that include them in the revenue streams created by some over-the-top providers. Is Another National LTE Network Needed? Do businesses and consumers in the United States need one more fourth-generation nationwide wireless network, aside from the existing Clearwire, soon-to-be-built Verizon and AT&T networks, as well as regional networks being created by regional mobile providers and cable companies, not to mention high-speed 3G networks running at top speeds of 22 Mbps? Though no firm answer can be given to that question, we might find out relatively soon whether investors think there is a need for another facilities-based 4G network of national coverage. Harbinger Capital, which recently merged with SkyTerra, proposes to build a fully integrated satellite-terrestrial network to serve North American mobile users, with a national 4G terrestrial network covering 260 million people by the end of 2013. The planned network would launch before the third quarter of 2011 and cover nine million people, with trials set initially for Denver and Phoenix. The next milestone is that 100 million people have to be covered by the end of 2012, 145 million by the end of 2013 and at least 260 million people in the United States by the end of 2015. Harbinger told the FCC that all major markets will be installed by the end of the second quarter of 2013. The original thinking has been that wireless services within a number of vertical markets that are highly dependent upon the ubiquitous coverage and redundancy to be provided by its satellite network would be the core of the business strategy. But Harbinger might think there is a market broader than that as well. Harbinger actually is required by the Federal Communications Commission to provide wholesale access to third parties, and also to restrict total Verizon Wireless and AT&T traffic to no more than 25 percent of total, to provide more competition in the market. The big issue is whether there is substantial need for additional spectrum at this point. One might argue that industry requests, as well as FCC proposals, for allocation of an additional 500 megaHertz of spectrum for mobile broadband are clear evidence of need. But there are other issues of market structure and competition. Assuming hundreds of new megaHertz of spectrum can eventually be relocated, most observers think the buyers of such spectrum would be the largest mobile providers such as AT&T and Verizon. The Harbinger network, by definition, would largely be a platform for other providers, as it would operate as a wholesale provider. The key business issue is whether there actually is sufficient business demand for another national 4G terrestrial network, though. 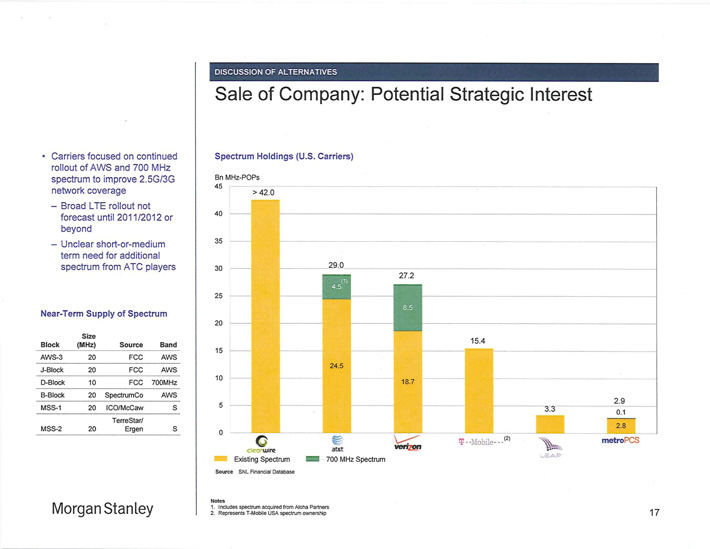 Sprint and Clearwire both have relatively lavish amounts of spectrum already, and both have shown a willingness to sell wholesale capacity. One might argue the key differentiator would be the satellite roaming features that would be available on handsets that normally default to the terrestrial network. But the bigger test will be of investor sentiment, as Harbinger will have to raise billions to build the new terrestrial network. The 36,000 base stations that Harbinger plans to use, along with the tower sites, backhaul and other gear associated with a terrestrial network will require billions of dollars worth of investment. Analyst Chris King at Stifel Nicolaus estimates that Verizon’s LTE network will cost about $5 billion to deploy. Clearwire has also spent billions on its network, with analyst estimates ranging from $3 billion to about $6 billion. There is no particular reason to think the ubiquitous terrestrial network Harbinger expects to build would cost less. Investors will have to be found first, before there is a chance to test the thesis that another facilities-based 4G network is needed. U.K. retailer Tesco, which began selling consumer VoIP service in 2006, now is pulling the plug, though it will continue to sell mobile service. Without reading more into the news than is warranted, the move is illustrative of the fact that consumer VoIP might be less an innovation than some had hoped for, and certaintly is a less-robust business than anticipated, especially compared to mobile service, at least for the moment. That is not to say other competitors, with different assets, can fare better. But the April 27, 2010 shutoff at least suggests that the "VoIP" market has not proven to be the lucrative business Tesco once believed it was, given its ability to support and market the business, as well as the evolution of end user demand, which arguably has tipped in the direction of mobility. Earlier in the last decade, there was much more apparent optimism that fixed-line VoIP would "change telephony forever," creating significant new opportunities for non-traditional providers. One might argue that VoIP's primary impact has been to accelerate voice price erosion, without creating a significant new market, though it has been the way cable operators have taken market share from telcos. Tesco says "trends in technology have moved forward since we launched Internet phone so that this is no longer a sustainable service". One might infer that means mobility now is the "hot" service. "Tesco Internet Phone" was basically a Skype-style PC offering, though the supermarket did offer a Vonage-style terminal adapter version as well. 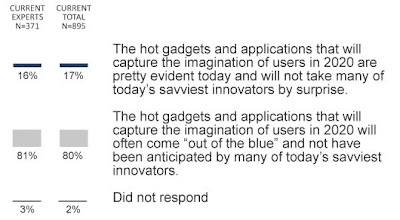 That is not to say further innovation in voice services is impossible, or in fact unlikely. There will be advances. The issue is whether the scale, impact and economic importance of such voice innovations is going to approach the advances being made in mobility, broadband, Internet and Web services. Google is making it easier for online advertisers to get TV-style ads, with obvious implications for both PC-based an mobile-based screens. If a video content provider reauthors its content to run using HTML5 instead of Flash, what does that mean? That the content is intended to run on Apple's iPad. And that is what CBS.com appears to be doing. None of this means the multi-channel video entertainment business is in trouble, by any means. But it is likely to be a step towards a future where that is a serious question. 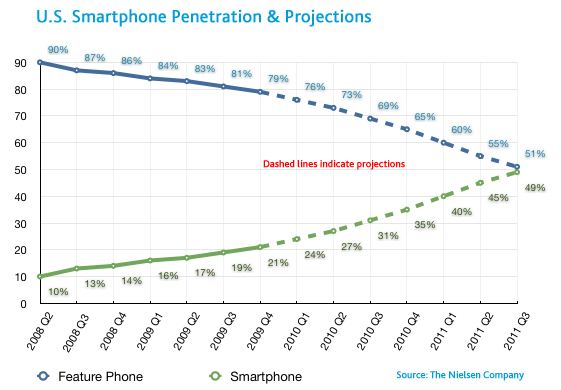 By 2011, there will be more smartphones in use in the U.S. market than feature phones, Nielsen now projects. The share of smartphones as a proportion of overall device sales has increased to 29 percent for phone purchasers in the last six months and 45 percent of respondents to a Nielsen survey indicated that their next device will be a smartphone. Given normal handset replacement cycles, it is possible to project that the installed base of devices will shift dramatically over the next two years. For those of you who wonder about such things, that would likely make the United States one of the world leaders in smartphone usage. Verizon Slows FiOS Build: Implications for National Broadband Plan? Many things have changed since Verizon Communications first began its FiOS construction program in 2004, and in the years leading up to that decision, when hot debates were held about the wisdom of fiber-to-neighborhood versus fiber-to-home networks. Mobile broadband, especially the faster 3G and new 4G networks, now will begin to offer a serious alternative for a signficant number of end users. Consumer resistance to paying higher prices for higher-speed fixed broadband (50 Mbps and above) has not lessened. Cable companies have solidified their position as specialists in the consumer services segment, with the exception of wireless. Given cable's position in consumer video and voice, financial returns from fiber-to-home deployments, in the mass market, are getting harder to justify, not easier. In many ways, leading U.S. telcos have found that their strengths in wireless and enterprise services are matched by relative cable strength in the mass market video and voice product segments. Also, opportunity costs arguably have risen over the last 10 years, opportunity cost representing the potential gains a company might have made if capital had been deployed elsewhere,, such as wireless or software, instead of high-capacity fiber access. In the background are concerns about the long-term relative value of multi-channel entertainment and voice revenues as well, which dampen financial returns from those two core services. Take all of that into account and the apparent lessening desire on Verizon's part to continue investing in fiber to the home is logical, perhaps even prudent. Given capital scarcity, burgeoning wireless and mobile broadband opportunities, as well as the slower growth for legacy services such as entertainment video, fixed access and voice, it would be hard to argue with an argument that effort is better placed squarely in the wireless arena, rather than fixed line services. For that reason, it is not a complete surprise that Verizon seems to be slowing its FiOS program, which had been nearing the end of the major construction phase, in any case. The company says it no longer will seek to build FiOS in communities where it has not already gotten video franchises issued. That means Verizon apparently will not undertake FiOS builds in Baltimore and downtown Boston, for example, a scenario many of us would not have predicted. Verizon is still negotiating for franchises in some smaller communities, mainly in New York, Massachusetts and Pennsylvania, but it is not working on securing franchises for any major urban areas. Verizon never committed to bringing FiOS to its entire local-phone service area, originally planning to make service available to about 18 milliion households by the end of 2010, a goal it will reach. Since the program began, however, Verizon also has been selling assets in less-populated areas in the Midwest and West Coast. Investors never have liked the FiOS program, which will wind up costing an estimated $23 billion. FiOS likely has been a key reason Verizon has been able to compete with cable companies. Verizon is the only major U.S. phone company to draw fiber all the way to homes and the only one to offer broadband speeds approaching those available in Japan and South Korea. But the financial returns have not been so overwhelming that the decision to expand the program is completely clear. Verizon's experience might be an implicit warning to policymakers that although the goal of 100 Mbps service, provided to 100 million U.S. homes, by 2020 is a fine stretch goal, but might face trouble if it means consumers have to pay significantly more for such service. Consumers might prefer 20 Mbps to 30 Mbps for $50 to $60 a month, rather than 50 Mbps for $100 a month, and certainly more than 100 Mbps for $150 to $200 a month. AT&T says it is taking a $1 billion charge for the first quarter of 2010 to account for increases in its costs because of the new health care plan. It isn't clear what the on-going hit to earnings might be. AT&T says it also will also evaluate changes to its health care benefits for employees and retirees, to avoid paying such charges in the future, of course. Sales of the Google Nexus One are now on the rise and beat the iPhone by 16 percent in February 2010, says RCS Limited, which expects the trend to continue. That data, based on U.K. results, contrasts with sales in the United States, where initial sales have been modest. It isn't clear that the statistic means a whole heck of a lot, though. Sales practices are quite different in the U.S. market, compared to others where devices often are bought "unlocked" and at full retail prices. Since most U.S. iPhones are bought at subsidized prices, while many to most Nexus One devices are bought at full retail price, the sales comparisons are difficult. Any expensive device sold primarily "unlocked and at full retail" is going to have low sales volume in the U.S. mobile market. Also, the Nexus One has been viewed by many as a "demonstration" project whose real objective is to show what can be done when Android open-source software and hardware are tightly integrated. According to a report by Flurry, Google sold roughly 135,000 of its new Nexus One phones in its first 74 days on the market. By contrast, Apple sold 1 million of the original iPhones in the first 74 days, while Motorola sold 1.05 million Droid phones -- which are based on Google's Android software -- during the same timeframe. U.S. to Lead in 4G Deployment? Does it Matter? People sometimes are fixated on global rankings that have marginal importance, such as which country has the highest penetration of mobility, broadband, Internet usage or some similar metric. Aside from methodological issues that make such rankings difficult, it isn't clear that such rankings mean much of anything. Consider the fact that the United States will have around 20 million Long Term Evolution subscriptions by end of 2012, and an additional six million mobile WiMAX subs, which would represent close to 25 percent of the global total of 4G subscriptions, says Strategy Analytics. That would, by anybody's estimation, make the United States a "leader" in 4G adoption. But it isn't clear that particular distinction means much, by itself. In times past the United States has been called a "laggard" in mobile phone penetration, "behind" other nations in use of text messaging and now is called by some a middling country in terms of broadband penetration. But the United States appears on track to become "the leading battleground" for 4G mobile services, says Susan Welsh de Grimaldo, Strategy Analytics director. "With broad commitments to LTE and WiMAX service launches, US operators will speed up the competition and create one of the most influential markets for new mobile broadband services and devices," she says. The point is that cross-national comparisons are difficult, and often of questionable value. The U.S. market no longer is "behind" in text messaging or mobile adoption in any meaningful way. And while one always can argue average or typical speeds are not the fastest in the world, most countries that are "ahead" on such measures are very-small countries with high population density, which makes construction far easier than is the case for a continent-sized country with lower density. Nor will it mean quite so much to say the United States will "lead" in 4G, either. Lagging broadband metrics do not seem to have inpaired U.S. leadership in software and Internet development, for example. Can text messaging be used to create a mobile version of eBay in India? Bharti Airtel intends to find out, by introducing "Mobile Bazaar," a way to buy and sell virtually anything that is legal using a standard mobile phone capable of text messaging. The SMS-based service enables buyers and sellers to find each other and conduct transactions with each other using only text messaging, especially short codes, with no need for a mobile browser or data connection. For starters, Bharti has set up a community for trading mobile phone devices, and will create similar communities for real estate, automobiles and electronics. The initiative is interesting for the same reason many such innovations are throughout much of the world. Though mobile broadband will be a more-logical approach in markets such as the United States, there are many markets where text messaging and voice are the two ubiquitous communication modes. In many places, a simple text message in the morning can give a farmer what he or she needs to know before settingout on a seven-mile walk to market. That's very valuable, in terms of fostering economic development. Sprint Nextel and Clearwire executives have said for some time that WiMAX and Long Term Evolution are similar enough that Clearwire could switch to LTE at some point. But that is more likely to happen when another technology migration to "fifth-generation" technology happens, not in the fourth generation. In one respect, battles over air interface are simply part of the mobility business. Just as AT&T and T-Mobile opted for the GSM air interface while Sprint and Verizon opted for the rival CDMA air interface, and similar battles were fought over 2G standards, carriers will have to migrate their platforms over time, just as they always have. The evolution from GSM (3G) to LTE (4G) will still require a new network, with a new air interface, operating on discrete spectrum and requiring new handsets and software. For that reason, each technology generation requires a fork lift upgrade and a refresh of consumer terminals as well. That's just part of the business. So though Clearwire and Sprint chose WiMAX for 4G, their options for 5G remain open, and both Dan Hesse, Sprint CEO, and Bill Morrow, Clearwire CEO, say they could opt for an LTE derivative for 5G. Hesse says the choice of WiMAX was based on the fact that Sprint could not wait for LTE standards to jell. It had a business need to move, so it did. "WiMax was tried-and-true tested technology at the time we made the choice," he says. "We couldn't wait." AT&T will begin its national roll out of femtocells, which it brands as the AT&T 3G MicroCell" beginning in mid-April, with new markets activating in cities across the continental U.S. for the next several months. The AT&T 3G MicroCell improves in-building reception for mobile devices by creating a local mobile repeater site, like a Wi-Fi connection does. The femtocell uses the home broadband connection for access, offloading mobile traffic to the fixed broadband network and therefore avoiding any reception problems in the home or building. Developed in conjunction with Cisco and in a public trial in select markets since September, AT&T 3G MicroCell is available for a one-time cost of $149.99. Consumers with AT&T 3G MicroCell will be able to easily activate the device the same day it is purchased. Customers may define up to 10 mobile phone numbers that can use the femtocell and up to four devices can operate on it simultaneously. There is no recurring cost, but mobile minutes will be deducted from a user's account as they would be if on a mobile macro-cell. Customers on "Family Talk" plans can pay an additional $19.99 a month to make unlimited calls from the Microcell, without deducting any minutes from their plans. Consumers who select 3G MicroCell calling plans at purchase are also eligible to receive a $100 mail-in-rebate toward the purchase of AT&T 3G MicroCell. Customers who also purchase a new line of broadband service with AT&T (DSL or U-verse 1.5MB or higher) are also eligible for $50 rebate. Sprint Nextel Chief Executive Dan Hesse said that in about two years, monthly mobile phone bills will focus on the amount of data used and move away from the number of available voice minutes. Of course they will. The entire global telecom business is migrating from a voice revenues model to a broadband revenue model. Along the way, some voice services or applications will be offered at no incremental cost, or very-small amounts of money. In other cases access to voice services will simply be bundled with other features and services, much as one today can buy, for one flat price, unlimited mobile Web access, text messaging and voice. That doesn't mean data usage will billed as electricity, water or natural gas are. It does mean retail packaging will shift, over time, to methods that emphasize "access" to a network and many services, rather than a simple metered approach. Observers rightly note that most U.S. consumers do not like strictly-metered usage for the simple reason that it creates billing variability. Consumers prefer the predictability of fixed monthly charges, which accounts for some of the popularity of "buckets of usage." But that doesn't necessarily mean people object to some broad correlation between intensity of usage and the size of monthly bills. Hesse's comments also reflect the simple reality that, for many people, voice is less important compared to texting, instant messaging and other things that can be done with a mobile device. Hesse is only saying that end user value should be related in some rather obvious way to retail pricing. The Federal Communications Commission does not have the explicit power to regulate the Internet, and should wait for Congress to grant it that authority, says Tom Tauke, Verizon EVP. The statement is not as controversial as some might think, as Comcast has challenged such authority in federal court, and many observers think Comcast will prevail. Comcast has challenged the FCC’s authority to punish it for throttling the bandwidth of customers using bitTorrent programs to share huge files. 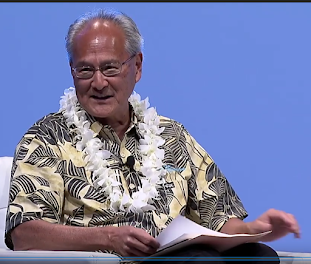 “The authority of the FCC to regulate broadband providers under the so-called ‘Information Services’ title, or Title I, of the Communications Act [is] at best murky,” Tauke said. “In confronting this hard question about jurisdictional authority, we [are] also faced this policy question: If Title I and Title II don’t apply to the Internet space, what are you saying about the authority of government in this space? “In a market developing at these speeds, the FCC must follow a piece of advice as old as Western Civilization itself: first, do no harm," said Tauke. “Today about 96 percent of Americans have access to at least two providers of wireline broadband and as many as three wireless providers, and more than 55 million Americans can connect to a broadband network capable of delivering at least a 50 Mbps stream," Tauke said. A newly-formed coaltion of cable companies, AT&T, Intel, Microsoft and industry trade and non-profit groups have created a "Digital Adoption Coalition" to apply for funding under the "broadband stimulus" program. The Digital Adoption Coalition includes AT&T, BendBroadband, Bresnan Communications, Bright House Networks, Cablevision Systems Corp., Charter Communications, Comcast, Cox Communications, Connected Nation, Eagle Communications, Inc., Dell, Intel Corporation, Mediacom Communications Corp., Microsoft, Midcontinent Communications, the National Cable & Telecommunications Association (NCTA), One Economy Corporation, Sjoberg’s Cable TV, Suddenlink Communications, Time Warner Cable, US Cable Group, and USTelecom. To improve broadband access, services, and technology in approximately 250,000 low-income households nationwide, the coalition would work with the U.S. Department of Housing and Urban Development to increase broadband outreach efforts in public housing, project-based Section 8 properties, and multi-family assisted communities. One Economy, a global nonprofit, filed an application with NTIA on March 15 on behalf of the coalition for funding through the Broadband Technology Opportunities Program (BTOP) to support digital literacy training, discounted computers, and project administration. Google wasn't sure what its business model might be when it launched its search engine. Apple probably isn't quite sure what people might do with its iPad, either. Apple's "iWork" suite positions the iPad as a road warrior device, at least for users who don't mind the lack of multitasking or cameras, and mostly want access to email and Web browsing. But some might argue that is precisely what some users already do, but using smartphones. Or will the iPad wind up being a media playback device more akin to an iPod "touch" with a much-larger screen? Or, instead of revealing or creating the existence of a new and sizable niche between the touchscreen smartphone and the netbook, perhaps the iPad might, in either the current or a later iteration, reset expectations for what a "netbook" or "notebook" PC actually is, and ought to be. That seems most likely for relatively casual users, at least at the moment. Previous attempts to create a new "tablet" market failed. Apple's Newton was a flop, and Microsoft's "Tablet PCs" didn't do much better. But those devices were aimed at business users. The consumer market for "tablet" style is probably best envisioned as a larger-screen version of the iPod touch and competing media players, the Kindle and its many e-reader readers. Media consumption, not "computing," could be the new niche. The ability to convince traveling business users to lug one more device with them does not seem promising. On the other hand, the iPad will require a backpack; it doesn't fit in a pocket or most purses. T-Mobile USA says it expects to have 100 metropolitan areas in the United States covered by its upgraded high-speed wireless network, which should operate up to about 21 Mbps or 22 Mbps in the downstream direction, by the end of 2010. The new HSPA-Plus network is a "3G" technology that operates at speeds very comparable to 4G alternatives, and might very well give T-Mobile the fastest national network, for at least a while, by the end of the year. HSPA Plus will cover roughly 180 million Americans by the end of the year, T-Mobile USA says. The technology is already live in some regions, including the New York metropolitan area, the Washington DC suburbs, and will be coming soon to Los Angeles. Oddly, many observers continue to insist there is "no competition" in the U.S. broadband market. Aside from cable operators and telcos, there now are going to be four mobile broadband networks in national operation by the end of the year, offering speeds equivalent to, or faster, than is available in many markets from terrestrial providers. It doesn't appear that consumers view the iPad primarily as an e-book reader, but more as a media appliance, a comScore study suggests. Though 37 percent of respondents indicated they were “likely” or “very likely” to read books on the device, nearly half indicated a high likelihood of using the iPad for browsing the Internet (50 percent) and receiving and sending email (48 percent). More than one third said they would use it for listening to music (38 percent), maintaining an address book or contact list (37 percent), watching videos or movies (36 percent), storing and viewing photos (35 percent) and reading newspapers and magazines (34 percent). says comScore. “These devices have the potential to be incredibly disruptive to the way consumers currently access digital content," says Serge Matta, comScore EVP. The big issue is whether there exists a sizable market for a digital appliance somewhere between a netbook or notebook PC and an iPhone. In that regard, when asked whether they would use an iPad “instead of” or “in addition to” other digital devices, the highest amount of potential substitution was for the iPod Touch (37 percent). Conversely, despite widespread belief that the iPad might threaten netbook adoption, only 22 percent of consumers said they would use an iPad in place of a netbook. The most important device attributes that consumers indicated they would like to have included in the iPad were: ability to use multiple applications/programs at once (43 percent), having a screen the same size as a laptop or desktop computer (37 percent) and having a built-in camera (34 percent). Among iOwners, the percentages were substantially higher at 56, 66 and 51 percent, respectively. Some 34 percent of males indicated they were likely to use the iPad for playing action, strategy or role-playing games, as did 28 percent of females. More than half of those 18 to 24 year olds (53 percent) said they were likely to use the iPad for gaming. Younger consumers indicated a high willingness to pay for news and magazines specially formatted for e-readers. About 68 percent of 25 to 34 year olds and 59 percent of 35 to 44 year olds said they were willing to pay for this type of content. If comScore's results prove to be correct, the iPad will emerge as a media appliance. Almost nothing is more predictable than the CTIA reporting that revenues, subscribers and wireless data increased over the last six-month period. In fact, many of us cannot remember a six-month period where that has not happened. So it is that the CTIA says wireless data service revenues increased 25.7 percent from the last half of 2008 to reach more than $22 billion for the last half of 2009, CTIA-The Wireless Association says. Wireless data revenues now represent more than 28 percent of all wireless service revenues. The number of data-capable devices has grown to 257 million units, up from 228 million at the end of 2008. About 50 million of these devices are smart phones or wireless-enabled PDAs and nearly 12 million are wireless-enabled laptops, notebooks or aircards. More than 822 billion text messages sent and received on carriers’ networks during the last half of 2009, amounting to almost five billion messages per day at the end of the year. As of December 2009, the industry survey recorded more than 285 million wireless connections. This represents a year-over-year increase of more than 15 million. Also, wireless penetration is now equal to more than 91 percent of the U.S. population, CTIA says. Other highlights of the survey include wireless customers using more than 1.12 trillion minutes in the last half of 2009, up 38 billion from the last half of 2008—and breaking down to 6.1 billion minutes-of-use per day. Wireless service revenues for the last half of 2009 amounted to almost $77 billion—up from a little more than $75 billion in the last half of 2008. AT&T now allows consumers to buy a $99 triple-play bundle that allows customers to choose wireless as their voice option, rather than a fixed landline voice service. The not-unexpected move shows both the appetite end users have for such packages, as well as AT&T's decision that now is the time to put more emphasis on gluing wireless users to the landline services, and less emphasis on using broadband and television to slow the rate of wireline erosion. That isn't to say the original impulse is no longer important. It remains important for many customers. But the new bundles reflect the growing demand for wireless voice in triple-play bundles, rather than fixed line voice service. AT&T "U-verse Choice" bundles start at $99 a month for three AT&T services, including U-family; U-verse High Speed Internet Pro (up to 3 Mbps downstream); and a choice of AT&T Nation 450 wireless voice or U-verse Voice 250 home phone. Other packages featuring faster broadband speeds and more wireless or home phone calling minutes or more TV channels for $127 to $150 a month. Where U-verse service is not available, customers can bundle DirecTV service with broadband and voice. Twitter is a social networking medium, but it also is a news distribution mechanism, it appears. 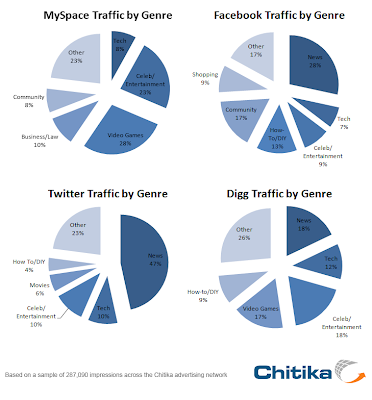 A new stydy by Chitika shows Twitterers mostly consume news while MySpace users want games and entertainment. Facebook also is a news site, but less so than Twitter is. About half the traffic (47 percent) that Twitter generates falls into the news category. In fact, Twitter users’ interest in the news genre surpasses that of Facebook users by nearly 20 percent, which would appear to make it the number-one social network for news-focused users. MySpace users, on the other hand, seem to have no interest in news whatsoever. Instead, MySpace members seem to prefer video games (28 percent) and celebrity and entertainment content (23 percent). Light and Electric, Thomas Howe's consulting company, has produced an e-book on cloud computing, featuring essays by 20 "thought leaders." The idea was to capture thinking about where are in early 2010 and where we might be over the next several years. Howe says that "in the not-so-long-ago past, the thought leadership for communications belonged to those large service providers, vendors and media outlets, as they were the only entities with the practical authority to comment on or effect changes large enough to matter." That isn't exclusively the case anymore. The e-book is free and available for download directly from this site: http://cloudcommbook.squarespace.com/get-the-book/. In addition, for a nominal fee to cover printing and delivery, it is also available in tree-killing hardcopy edition, and bit-killing Kindle edition. National Broadband Plan: Where Does U.S. Rank? Where Can it Rank? A six-spot gain to 9th place in international broadband rankings would be a successful outcome for the Federal Communications Commission’s National Broadband Plan, says the Phoenix Center. Historical trends suggest the United States will likely move to 13th in broadband adoption by 2012 even without significant policy changes, however. The new Phoenix Center study, "Evaluating Broadband Stimulus and the National Broadband Plan: Establishing Expectations for Broadband Rankings", uses a variety of standard econometric techniques to determine where the United States is expected to rank given current trends, and where the United States should rank if the National Broadband Plan and federal broadband stimulus are successful. Many observers point to U.S. rankings on global indices of broadband penetration, cost or speeds as evidence that the United States is lagging behind other nations. But comparing very-large countries with very-small countries, with different population densities, government policies, household sizes and incomes is difficult. For example, the United States ranks no better than 15trh in global measures of telephone density. But nobody really suggests the United States has a fixed-line voice availability problem. In fact, most observers say demand for that product is declining. 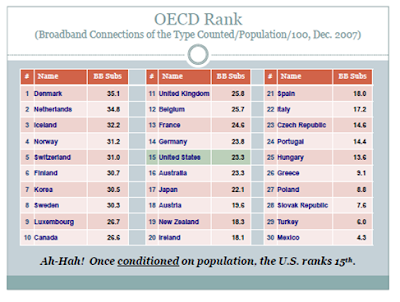 So where does the United States currently rank on per-capita measures of broadband penetration? 15th, as it turns out; precisely where it has long ranked in terms of fixed-line voice line penetration. If one is not a problem, why is the other? As if forecasting telecom, cable and Internet spending were not hard enough, it is about to become much-more uncertain, for reasons most of us probably could never have expected: a decades-long suppression of end user consumption to re-balance structural deficits. Developed countries with big budget deficits--including the United States--must start now to prepare public opinion for the belt-tightening that will be needed starting next year, John Lipsky, says International Monetary Fund first deputy managing director. Gross general government debt in the advanced economies will rise from an average of 75 percent of gross domestic product at end-2007 to 110 percent of GDP at end-2014, even assuming that temporary, crisis-related stimulus steps are withdrawn in coming years. Reducing the ratio to the pre-crisis average of 60 percent by 2030 would require raising the structural primary balance -- before interest payments -- from a deficit of about four percent of GDP in 2010 to a surplus of about four percent of GDP in 2020 and keeping it at that level for the following decade. That clearly implies an eight percent swing in balances, before interest payments. Lipsky also says the scale of the adjustment is so vast that less-generous health and pension benefits, government spending cuts and increased tax revenues are needed. The drops in government services to individual citizens and businesses could be unprecedented, some therefore suggest. The obvious danger is that the U.S. Congress seems hell-bent on making the problem worse by continuing to spend as though it had the means to pay for its spending. The IMF has for decades both scolded and disciplined developing nations unable to balance their budgets. Now it appears the United States, for the first time, is headed that way as well. The ramifications are not entirely certain, but slower economic growth is likely and social strife virtually inevitable. It is not immediately certain what all of this fundamental change will mean for providers of communication and other services to businesses and consumers, but it probably will a mixed impact. If one assumes consumers will have less disposal income, one would expect pressure on overall revenues and profit margins. But consumers will also have to make choices about discretionary spending, and past behavior suggests that communications and entertainment services are high priorities. All indications are that broadband access will become, with mobility, anchor and foundational services, the key issues for service providers being the cost of delivering those and other services, as well as creating a sustainable new role in the revenue chain for application usage. It is not so clear what will happen to demand for today's packaged multi-channel video services. So far, mobile and online video usage seems incremental to other existing forms of video consumption, but much depends on what content owners decide is in their best long-term interests. Major change in distribution methods is possible, but not likely in the short term. But businesses also will be forced to operate more frugally, which could have a variety of effects. In the recent recession business revenue dropped, except for providers taking market share. The upshot is that most consumers will have less to spend, though. That could send the United States and other developed nations into a downward spiral where muted consumer activity undermines GDP growth. The point is that our historical experiences with post-recession recoveries will be stressed in new ways this time around, specifically because the macro-economic stresses are so novel. The United States never before has had to be told by the IMF to adopt austerity measures, and people have not had to live through such a period. But we are about to. And means everybody who tries to forecast revenue for telecom, cable and Internet companies, as well as others in the ecosystem, must face increased uncertainty. That doesn't necessarily mean the underlying assumptions will change. They might not. But it is not clear at the moment what could change, and we might not know for several years what the nature of those changes are. It isn't immediately clear how soon debt service will become a major business issue in the United States, but it is clear it will be. Moody's analysts, looking at sovereign debt loads in the United States, say there is no way to "grow" our way out of the problem. Note the phrase "at levels that will test social cohesion." What Moody's means is that, to keep its credit rating, given the fact that economic growth, even robust growth, would not grow tax revenues enough to take care of the problem, the federal government likely will have to cut spending, though it also will try to raise taxes. And that is going to lead to protests, anger and unrest. But there will not be a choice. If the United States does not act to preserve its credit rating, it will be more costly to borrow money, driving the debt burden even higher and threating yet another round of downgrades. Such a downgrade also would force an immediate reduction in debt-financed spending. And that is precisely what the United States currently is doing: spending more than it raises in taxes and borrowing to support the shortfall. Moody’s says the United States and other major Western nations, particularly Britain, have moved “substantially” closer to losing their current ratings. The ratings are “stable,” but “their ‘distance-to-downgrade’ has in all cases substantially diminished,” Moody's says. As if fixed-line providers of entertainment video, voice and broadband did not have enough problems, it appears there are fewer households to sell services to, these days. Lower housing starts and a severe job market are obvious reasons why uptake of new services has been challenged. But it appears there are other demographic changes at work as well. More young people, for example, are living longer with their parents than once was the case. Also, more people in their 20s have moved back in with their parents. That is important as younger people represent one of the biggest groups of "single person" households. If there are fewer of those sorts of households, there are fewer potential occupied homes to sell services to. A 2009 Pew Research survey found that among 22- to 29-years-olds, one-in-eight say that, because of the recession, they have boomeranged back to live with their parents after being on their own. That suggests as many as 12.5 percent of those 22 to 29 have removed themselves from the ranks of households with a possible need for fixed line communications or entertainment services. Those trends, in turn, seem to have been driven by the recession's impact on younger workers. According to a Pew Research Center analysis of Bureau of Labor Statistics data, as of 2009 some 37 percent of 18- to-29-year-olds were either unemployed or out of the workforce, the highest share among this age group in nearly four decades. In 2000 there were about 42 million people living in multi-generational households. In 2008 there were 49 million, and one suspects that number grew in 2009. Perhaps the real story here is a recognition that not much really can be done, or perhaps ought to be done, about the existing fixed-line broadband access market, except to encourage existing providers to upgrade speeds. There are some fairly-significant implications one might draw from the Federal Communications Commission's proposal for National Broadband Policy. First of all, the plan explicitly relies on private capital and private firms to get the job done. There are some important tweaks to funding of services rural high-cost areas, and a bit of new spending in other areas. But those are a gloss. The heavy lifting clearly is going to have to be done--or left undone--by private capital and existing service providers. People can continue to advocate for, and support, alternative ways for getting things done, but there is at this moment no sense that radical changes in industry structure are possible. Some might argue that the country would be better off with a robust wholesale infrastructure, retail provider model, but that is not on the table. The other really-significant implication is that the future will belong to wireless. In fact, the really-big proposal is to reallocate 500 megahertz of wireless spectrum away from TV broadcasting and to wireless communications. In fact, though any of us might grumble that prices are too high and speeds too low, the FCC's own data suggests that "access" actually is not a problem, even restricting the definition to fixed networks. The FCC says 78 percent of U.S. homes already have access to two broadband service providers. About four percent have a choice of three providers. Another 13 percent have at least one provider. 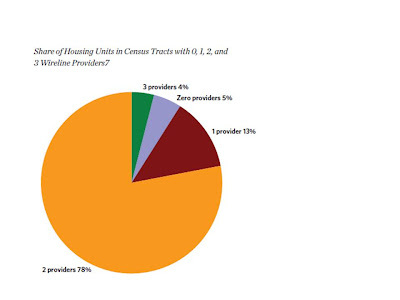 Only five percent of homes do not have at least one fixed services provider. And, again, those estimates do not include two satellite broadband providers and between one to four mobile broadband providers as well. Separately, the FCC notes that 77 percent of U.S. households already can buy service from three wireless broadband providers. Another 12 percent of homes have a choice of two mobile broadband providers, while none percent of homes have at least one mobile broadband service provider. Only two percent of U.S. homes cannot buy mobile broadband service. For a variety of reasons, the FCC plan implicitly acknowledges that the current fixed broadband duopoly is about as good as it will get, and that, going forward, mobile broadband is the new battleground. The FCC probably is completely right in that assessment. Mobility is the one industry segment that would have relatively little trouble attracting lots of new capital investment, and mobility is the one segment of the whole communications business that is exploding globally, not just in the United States. Mobility is the segment where innovation already is the fastest, where new applications and devices are proliferating most rapidly, and where consumer interest and new adoption is highest. Like it or not, the FCC always works within a political context. It has to work within the constraints of what is possible, and the emphasis on wireless is a clear reflection of those constraints. The FCC is smart enough to understand that, so long as private capital and private firms must drive the bulk of national investment and service provision, the agency must work within the constraints of the capital markets, which clearly signal that the perceived upside, and therefore investment interest, lie in wireless and over-the-top applications, not more wired infrastructure. Now this is truly clever, really. Google Nexus One: Lessons to be Learned? New sales data on the Google Nexus One smartphone has most observers concluding that Google has failed with its launch. Flurry notes that the Nexus One has shipped about 135,000 units in 74 days, where Apple shipped a million iPhone units in its first 74 days while the Verizon Droid sold a bit more than a million units in its first 74 days. "Google Nexus One may go down as a grand, failed experiment or one that ultimately helped Google learn something that will prove important in years to come," Flurry notes. But the sales curve might suggest something about the distribution channel more than anything else. 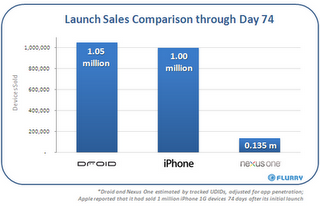 Droid's sales suggest it is not the Android operating system which accounts for the low sales. More likely the low sales are the result of a combination of changes in the typical distribution system. Most users buy their devices from carriers, most often preferring a discounted handset with an accompanying contract. Google has been selling only unlocked devices, and only from a Web site, at full retail price. One could have predicted that would not be popular. Also, Google initially started out with email support only. Given the history of consumer unhappiness with mobile service provider customer service, that also could have been predicted. When people have a problem, they want to talk to a live person, and they want to talk "now." Also, though some policy advocates have been loudly calling for sales of unlocked devices as a consumer choice value, most consumers care less about unlocked devices and more about customer support. In an unlocked device scenario, it isn't clear whether it is Google, the handset vendor or the carrier that has the issue causing the problem. Consumers may have issues with contracts, but they also prefer lower phone prices and the assurance that if there is a problem, the retailer will take responsibility. What Google's experiment mostly shows is the value and power of an integrated distribution model, with clear responsibility and good customer service support. Unlocked devices do not generally resonate, and neither do full price handsets, especially when customer experience after sale is so poor. Oddly enough, the proposed National Broadband Plan is light on new spending and puts primary emphasis on wireless, while mixing in a bit of a grab bag of existing and vexing voice-related issues. The goal of getting 100 Mbps service to 100 million U.S. homes by 2020 appears to be just that, a "goal," not a requirement. Some people would call that a mistake, but the Federal Communications Commission is not unmindful of some basic facts, including the requirement that the investment heavy lifting must be done by private industry, and that means raising lots of investment capital from private sources. Those sources already have made clear their fears that too much tinkering with broadband regulations, especially regulating broadband access as a common carrier service, will choke off investment. The single-biggest substantive proposal is the plan to make 500 megahertz of new spectrum available for wireless communications by reallocating spectrum presently used by TV broadcasters. It might be close to heresy, but if you look out 10 years, the business case for investing lots of money in fiber to home facilities is starting to look worse, not better. Many policy advocates call for much-higher speeds and lower costs at the same time. That's not a convincing scenario for investors who would have to take a chance on loaning money in that sort of market. Also, to the extent that entertainment video has been a big part of the business case, not many observers would believe the future is as bright as the past has been. With voice also under pressure, it may not make as much sense as it once did to invest too aggressively in fixed broadband. Broadband still is the foundation service for fixed networks in the future. But that is a different issue from the separate issue of how much investment ought to be made, because it is unclear how much users are willing to pay for really-fast service, or how much incremental revenue might actually be created by new applications that require really-fast broadband. Mobile App Stores: A Closer Look from Plugg Conference on Vimeo. A study conducted by mobile analyst Chetan Sharma and sponsored by GetJar suggests the market for paid mobile apps should grow to $17.5 billion within the next three years, implying a value greater than CD-based apps in 2012, when apps sold on physical media are projected to be $13.8 billion. App downloads will leap from slightly more than seven billion in 2009 to nearly 50 billion in 2012, representing an annual growth rate of 92 percent, the study also suggests. According to the study, by 2012, off-deck paid-for apps will be the biggest revenue generator, accounting for almost 50 per cent of all apps revenue. In 2009, on-deck apps available from mobile operators accounted for over 60 percent of all apps revenue, but this will fall significantly to just under 23 percent by 2012. The average app selling price for apps in North America was $1.09, significantly higher compared to that in developing markets such as South America ($0.20) and Asia ($0.10). According to the study, revenue opportunities in Europe are set to grow from $1.5 billion in 2009 to $8.5 billion in 2012, while in North America the figure will rise from around $2.1 billion to around $6.7 billion in 2012. Currently, apps are most popular in Asia, with the region accounting for 37 percent of global downloads (free and paid) in 2009. North American downloaders spend the most money on apps, accounting for over 50 percent of global app revenue. Advertising and transactions are a growing portion of the way applications are monetized, though purchase fees will represent most of the revenue for the near term. The global telecom industry performed pretty much as it always does during the recent recession. Basically, revenue growth continued at low single digits, overall. As always is the case, some industry segments fared better than others, but consumer demand for communications and entertainment video services was steady. Some might wonder whether some clear signs of consumer frugality will affect growth rates for some time to come, but even that is not the big issue. The big issue is that wired communications is an industry with a cost structure too high for expected revenues over time, so cost cutting must continue and network operations must become even more efficient than they have, up to this point. Ovum researchers point out that "the economic downturn hasn’t resulted in the downward pressure on telco top lines that many expected." But Ovum researchers also point out that "revenue growth is in decline for many mature market operators, and slowing for those in emerging markets." “Market saturation, increased competition and regulatory intervention on roaming and termination rates won’t disappear just because the economy picks up”, says Ovum Principal Analyst Clare McCarthy. Telcos are cutting operating expenses and capital investment. They are also accelerating employee early retirement programs and stockpiling cash. Many telcos in fact are emerging from the downturn with healthier balance sheets than when they entered, as well as significant cash balances, Ovum says. Covad Communications Company is launching nationwide Ethernet access services in mid-April. Designed especially to support business-class, real-time applications like Voice over IP, video, gaming, virtual private networks and video conferencing, at speeds from 1.5 Mbps to 35 Mbps out of more than 4,000 central offices reaching approximately 10 million businesses nationwide, the company says. Covad will offer quality of service and class of service features and are backed by service level agreements. “What will differentiate this product in the market are the integrated QoS and CoS options that give our partners immense flexibility in optimizing network performance based on their application requirements,” says Patrick Bennett, president and chief executive officer at Covad. Covad began testing Ethernet services on a technical level with a limited offering in selected markets last year. As the mobile industry starts selling more connections to support sensor networks and non-traditional mobile devices such as game players and media players, it is going to create new charging methods as well. The Kindle, for example, hides the cost of connectivity in the sales price of content. That model likely will become more popular over time as more devices emerge that require occasional connectivity, but are unsuited to the traditional monthly or prepaid billing plans. At the same time, assuming regulators do not outlaw the concept under the guise of "network neutrality," more operators may start experimenting with priority access and other quality of experience measure. 3UK, for example, gives users on more-expensive plans access priority access when the network gets congested. Tiered service levels are one obvious way to allow users to match their preferences with their payment plans. Application stores might offer another approach that is akin to the way Kindle now works. It might be the case in the future that some applications are sold in a way that incorporates the cost of bandwidth in the sales price of the software. Some users will want to pay less, and take their chances with YouTube viewing quality. Alternatively, a user might be able to buy a service that includes quality of service mechanisms for YouTube consumption. In principle, that isn't much different from selling access plans offering varying bandwidth at varying prices, or different buckets of voice minutes of use or text messages or data consumption. The concept might be especially attractive for users at two ends of the usage spectrum. Very-light users might prefer the lower overall cost of paying for just enough bandwidth to support their use of particular applications. "Power" or business users might be willing to pay much for the best possible quality for business conferencing or voice quality, especially when the network is congested. Yes, that is a combination of network management and bit discrimination. But there is no good end-user focused reason to give consumers a choice of consumption options. Augmented reality overlays information from the Web on top of objects in the real world, typically when a user points a mobile phone camera at objects in the real world. In some sense, augmented realtiy takes Web accessible data and projects it in real time onto physical objects viewed by the camera. There are all sorts of prosaic applications one can imagine. Helping people buy shoes and clothing is an obvious commercial example. Technology experts surveyed by the Pew Internet & American Life Project overwhelmingly agree that the killer applications and gadgets of 2020 can not be foreseen right now. About 80 percent of respondents said the killer apps of 2020 will "come out of the blue" and will not have been anticipated. For all the scenaio planning, brainstorming and research firms conduct and pay for, that is a rather surprising opinion. Essentially, most technology observers and technologists say we have no way of predicting what will be hot in 2020. That will not stop firms from creating product roadmaps and investing where they think the opportunities are greatest. Despite all that, we still are likely to be surprised in 2020. In 2000, nobody would have predicted the iPhone, or perhaps have bet that Apple would be a bigger company than Microsoft. The first is fact, the second "only" a directional trend. Microsoft today still is a bigger company than Apple, at least in terms of market value. 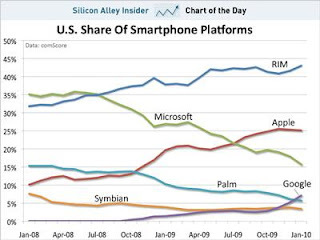 But the charts suggest Apple will overtake Microsoft. How many forecasters would have predicted that? I admit I use Google Chrome and Firefox more than I use Explorer and Bing. I use Google Maps; I don't use Bing Maps. But that doesn't mean Microsoft engineers are not working on new tweaks to provide more value for Bing and its related apps. Over the last three months, Research in Motion, Apple and Google have gained smartphone market share, while Microsoft and Palm have lost share, comScore says. 42.7 million people in the U.S. owned smartphones in an average month during the November 2009 to January 2010 period, up 18 percent from the August through October period. RIM was the leading mobile smartphone platform in the U.S. with 43percent share of U.S. smartphone subscribers, rising 1.7 percentage points versus three months earlier. Apple ranked second with 25.1 percent share (up 0.3 percentage points), followed by Microsoft at 15.7 percent, Google at 7.1 percent (up 4.3 percentage points), and Palm at 5.7 percent. Google’s Android platform continues to see rapid gains in market share. In an average month during the November through January 2010 time period, 63.5 percent of U.S. mobile subscribers used text messaging on their mobile device, up 1.5 percentage points versus three months prior. Browsers were used by 28.6 percent of U.S. mobile subscribers (up 1.8 percentage points), while subscribers who played games made up 21.7 percent (up 0.4 percentage points). Access of social networking sites or blogs experienced strong gains in the past three months, growing 3.3 percentage points to 17.1 percent of mobile subscribers. Social networking now is more popular than listening ot music, at least where it comes to mobile device activities. Will Historic Consumer Spending Patterns Hold Up? What Future for Telecom Business of 2015 or 2020? Do People Pay for "Access" When "Buying Content"? Collaboration is More than "Communications"
What Does iTunes and App Store Behavior Indicate?